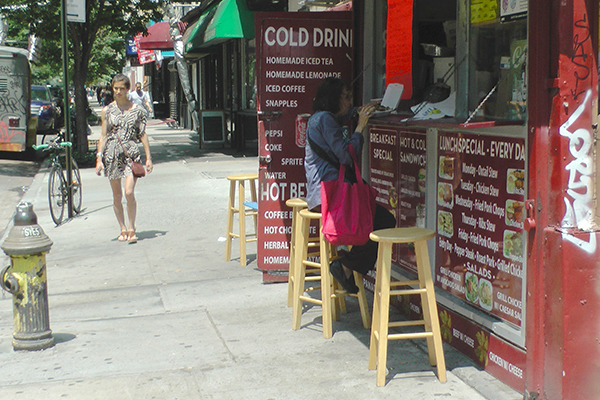 Back in November, I wrote about the beloved Jennifer Cafe, on East 4th Street, a small protuberance from the outside wall of the beloved Guayoyo, a Venezuelan restaurant on the corner of First Avenue. This is very special seating, too: your mouth is at the same level as the food, eliminating the necessity of having to lift your fork! East Villagers love to conserve energy! I almost wrote that: "shoveling food into their mouth"! The way these stools are positioned, you could even put your mouth *below* counter-level, for those last few bites!